Mundane Tasks is a steel blue crelly with green chrome flakes and green and fuchsia micro glitters. Shown is two coats plus top coat. Winter’s Gate is a very pale greyed lilac with gold/green/blue shifting aurora pigment. It has a good but slightly milky formula which makes it on the sheer side. I think this is my favorite of the bunch! Shown is two coats plus top coat. Causing Friction is a red based brown with golden/green shimmer, green/blue shifting iridescent flakes, and fuchsia micro glitters. Shown is two coats plus top coat. Reflected Glory is a coppery red foil holo with strong gold shimmer. Shown is two coats plus top coat. 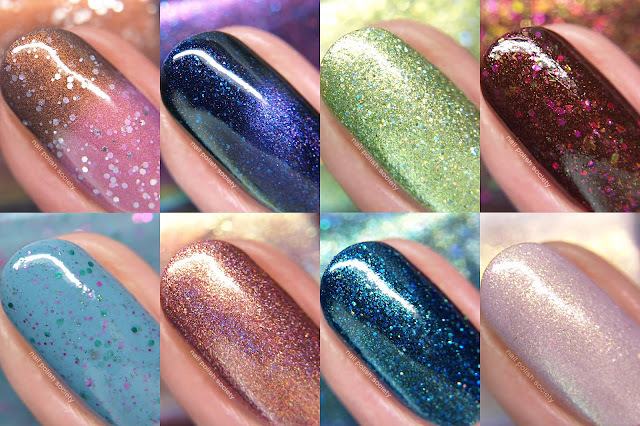 The Longest Night is a dark teal with golden/green shimmer and silver holographic micro glitters. Shown is two coats plus top coat. Travels By Day is a purple/gold/green multichrome magnetic with blue iridescent shimmer in a dark blue base. I feel like once I used the magnet the multichrome effect wasn't really obvious, but it is SO pretty! Shown is two coats plus top coat. Larger Than Life is a chartreuse with golden/green shimmer and silver holographic micro glitters. Shown is two coats plus top coat. Lost in Translation is a pale lavender pink (warm) to brown (cold) thermal with copper overlay and silver metallic micro glitters. I'm getting Neopolitan ice cream vibes from this shade, how about you? Shown is two coats plus top coat. Which are your favorites? My top picks are Mundane Tasks, Winter's Gate, and Travels By Day. You really can't go wrong with any of these!